TSHD 2500 Barito Equator first of its kind built in Indonesia. 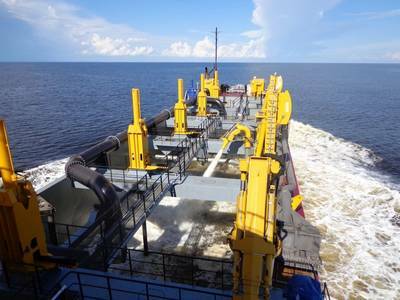 The delivery in early May of Trailing Suction Hopper Dredger (TSHD) Barito Equator demonstrates how Indonesia’s developing maritime industry is building ever more complex vessels, according to shipbuilder Damen. The 2,500 m3 capacity Damen TSHD 2500 is the first of its kind built in Indonesia and also the largest Damen standard hopper dredger built to date. For Indonesian dredging company Pelayaran Fortuna Nusantara Megajaya (PFNM), the proven reliability of Damen’s design will be a key asset in maintaining economically vital cargo transport on the Barito River on the island of Borneo. Immediately after delivery, Barito Equator started on maintenance dredging on the 890-kilometre long Barito River in South Kalimantan. Indonesia has invested large sums in capital projects to improve navigability on the waterway – a key cargo and transport link. The river is prone to heavy siltation, which – combined with the extreme environmental conditions during dredging operations – demands highly reliable and efficient equipment. 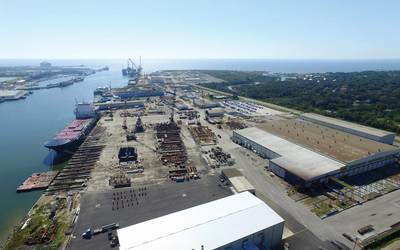 Last October the launching and naming of Barito Equator took place at Indonesian shipyard Steadfast Marine, which is located in Pontianak of West Kalimantan, the City of Equator of Indonesia. The local yard has helped advance Indonesia’s maritime ambitions through transfer of technology during the complex build with Damen Shipyards Group. The build took place with assistance from Damen Technical Cooperation (DTC), engineering from Damen Shipyards Gorinchem and the complete trailing dredging system from Damen Dredging Equipment. Damen Marine Components delivered the rudder installation and gearbox as well as a host of other components. Damen has long experience in delivering hopper dredgers as well as its Cutter Suction Dredger (CSD) range – both at its own yards and using DTC’s range of tailored global services. Damen’s standard TSHDs are optimised for maintenance duties with capacities ranging from 500 m3 to 2,500 m3. The wide array of available options allows functionality to be added to fit the particular requirements of any dredging assignment, while the standard design ensures short lead times. For Damen’s range of TSHDs, Damen Dredging Equipment designs and delivers the trailing suction dredging systems – including the complete trailing pipe, dredge pumps and deck equipment. The Netherlands-based manufacturer also supplies made-to-measure trailing dredging kits for other new builds and retrofits at third party shipyards around the world. With an overall length of 80.35 metres, the TSHD 2500 has a trailing dredging depth of 22 metres with 750 mm dredging pipe. Discharge is via bottom doors and bow coupling. For the build in Indonesia, As with all Damen’s TSHD and CSD deliveries, Damen offers global life cycle support and spare parts contracts supported by Damen Field Service engineers available locally.